The beautiful Juliette dress is a collaboration between Brisbane based Designer Stokes Thompson and Melbourne Designer Hanni. This gorgeous silk georgette strapless dress has a hand beaded feature on the waistline and a thigh split allowing great movement. Hand Beaded Clear Glass Diamantes on Waist. 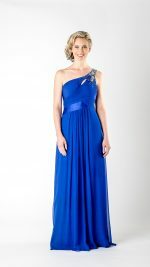 Perfect Wedding, ball or bridesmaids dress.